As awareness and understanding of prebiotics continue to grow, industry must unify stakeholders and share consistent messaging with media, consumers and regulators. 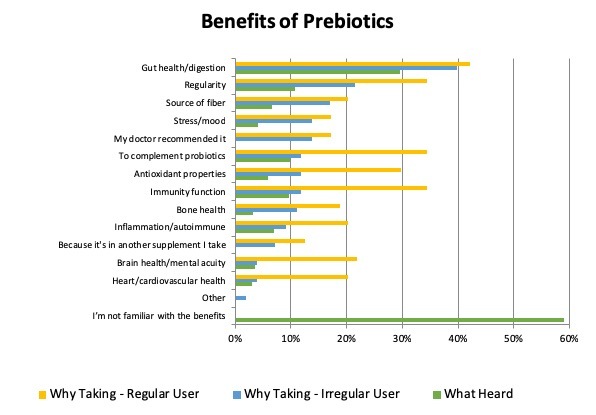 Consumer awareness about prebiotics is on the rise. Many factors have driven the increase, including the success and market penetration of probiotics. In a recent survey conducted by Trust Transparency Center and the Global Prebiotic Association (GPA), supplement-using consumers were asked their perception of the benefits of prebiotics. The data indicated that even greater than considering prebiotics as a source of fiber, consumers perceived a strong correlation between prebiotics and general gut health/digestion, as well as regularity. Established prebiotic users also made a strong association between prebiotics and potential immune health benefits, as well as a complement to probiotics. While there is work to be done, a firm foundation exists upon which to build. 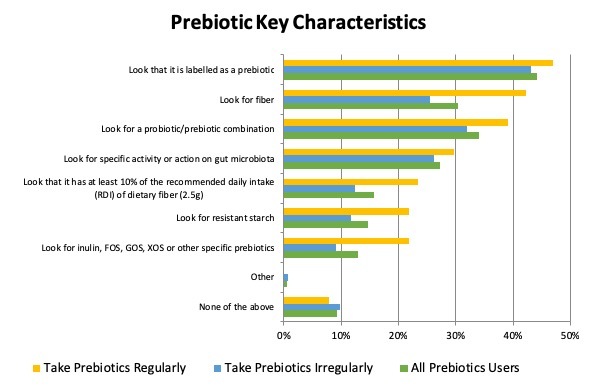 The chart below is from the same survey, conducted in 2018, digging deeper into the prebiotic characteristics consumers are looking for. Again, the word “prebiotic” had some resonance, but fiber as a characteristic was next in importance for regular users. The prebiotic/probiotic combination was also an important characteristic, followed by specific gut activity or action. Of lesser focus was the source or type of prebiotic. Positioning into dietary supplements and as health ingredients supported by mechanistic studies is likely a future imperative. To be able to show the specificity, tie it to health benefit, and also have a complete understanding of how it interacts with the microbiome and produces its ultimate health benefit would seem to be the goal. One key aspect of this effort is communicating a definition of “prebiotic” that is supported by the science, is easy for consumers to understand, and encompasses emerging work relating to the microbiome and how it operates. In watching probiotics take these same steps in recent years, proponents of prebiotics can glean that “simple is better” and getting everyone on the same page is paramount. Prebiotics must tell a different story from simply “fiber.” And they represent a different opportunity outside of functional fortification approaches, where an amount of fiber (largely as a commodity) is added to food. While there is decent understanding of what prebiotics do (among regular users), as in any category, broadening that base and simplifying the message are the objectives. Industry has the opportunity to manage the messaging so growth is responsible and sustained, and the category can contribute maximally to health. An immediate objective and priority of GPA is to unify stakeholders and share this message with media, consumers and regulators. Already there are different “definitions” in play, with the term “prebiotic” being used in different contexts, and both as a noun and an adjective (e.g., prebiotic effect or impact). Again, the ultimate message must be simple and concise. GPA will build from this workshop to steward accurate, responsible, sustainable growth of this category. Len Monheit is the executive director of the Global Prebiotic Association (GPA). A recognized industry analyst and thought leader, Monheit has more than 20 years’ experience in the natural products and dietary supplement industry, with over 15 years’ background in digital media. He has participated in dozens of speaking engagements across four continents, talking about best business practices, industry trends across the health and wellness industries, and success factors for international business development.